Whether you are a start-up company or an established retailer, developing a successful e-commerce business is not an easy task. There are many factors that must be kept in mind before deciding on a platform that best fits your business needs. Development costs, operational costs, maintenance costs and ongoing marketing costs must all be a part of developing a realistic budget. Like any other business, it takes money to make money. Many E-commere companies have emerged as a pioneer in developing Saas based as well as custom built E-commerce solution. 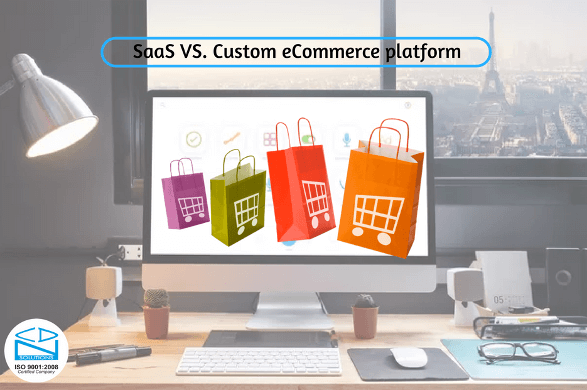 But before approaching an E-commerce firm big question is which one in better – SAAS or custom built e-commerce solution. Believe us, being an e-commerce solution provider firm we know that the clients faces this confusion very often. We have worked with lot of companies, varying from Enterprise, Retail, Consumers to Start-ups, to plan and execute SAAS based as well as e-commerce solution. The initial conversation is almost always the same and starts with excitement until they realize how much is involved. Most people underestimate e-commerce both in terms of the level of investment and the resources necessary to operate a viable website. In order to be successful, it takes a continual investment in strategy, development, marketing and customer service. The “Buy vs. Build” battle has been furious in IT circles for quite some time, and for some manufacturers and wholesale distributors looking to invest in eCommerce software, that battle is still being fought. The arrival of software as a service (SaaS) eCommerce solutions is making it easier than ever for businesses of all sizes to implement customized B2B eCommerce portals with minimal up-front costs. At the same time, some companies are still actively considering custom eCommerce development. To avoid acquire steep costs and operational downtime for your e-commerce site, going with a custom-built platform will prove to be more beneficial in the long run. Although it requires slightly higher initial investment costs and a great deal of maintenance, businesses can cut development time by hiring certified developers who will provide their expertise and support to get the platform on the market faster so your business can reap rewards quicker. For more information on custom e-commerce platform development services, visit here. WHICH IS RIGHT FOR BUSINESS? There are pros and cons to each approach and it’s true that you do get what you pay for. No matter which path you choose for the development of your e-commerce business make certain that you choose an experienced, reliable and accessible partner. Why to Adopt Enterprise Mobility for Your Organization?